Apart from the advent of the Internet itself, no phenomenon has both captivated and terrified travel executives as has the rise of mobile. Its impact continues to evolve – but the implications are profound. Phocuswright's The U.S. Mobile Traveler in 2017 report provides a complete view of the mobile traveler in 2017, including who they are, how they plan and shop for travel, how they use their device in-trip, and what it all means for travel brands and the industry overall. The mobile traveler population has been growing each year as more travelers own smartphones and use them to plan and book travel. Today, two in three U.S. travelers have shopped or booked either air or hotel on a mobile device (smartphone or tablet). Nearly half of those mobile travelers are under 35 years of age. But don't count out older travelers – they too are driving the move to mobile. 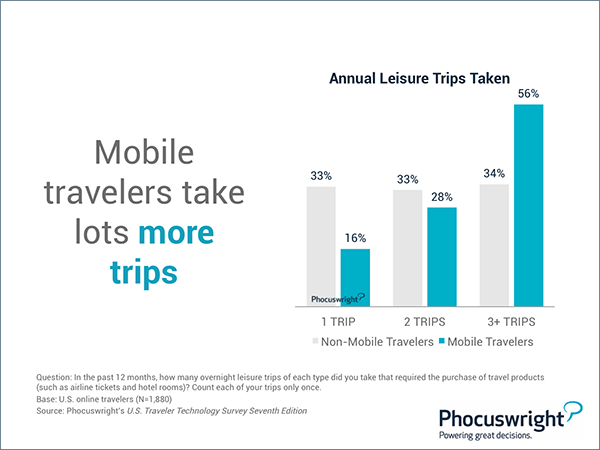 Mobile travelers are getting more comfortable planning on mobile, even as the population gets a little older. And with comfort comes confidence: 69% of mobile travelers feel they can find the same flight and hotel info on a smartphone as on any other device; 66% of mobile travelers are comfortable planning and booking a vacation only with a smartphone. When asked if travel is a very important part of one's lifestyle, mobile travelers in the U.S. were more likely to "strongly agree" than non-mobile travelers. Plus, they take more trips and spend more on travel. Do you subscribe to Phocuswright research? If so, great! Dig deeper into these insights and access the entire technology series: The U.S. Traveler Technology Survey Series. Not a subscriber? Learn how to access our subscriptions here.